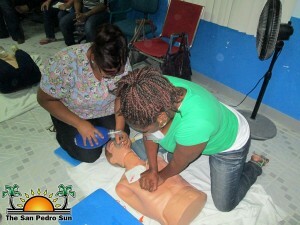 The staff of the Dr Otto Rodriguez San Pedro PolyClinic II has been trained and certified in Basic Life Support (BLS). The training was held via a course that all 17 staff members attended on Sunday February 17th. The course was made possible with the support of the Central Health Region, the Public and Private sector of San Pedro and the professional and patient trainers of Belize Emergency Response Team (BERT) consisting of Michael Pratt, Darrell Spencer and Chris Kirby. The administration of the PolyClinic would like to thank the staff for their time, willingness, and successful effort in completing the course, knowing that the training is both beneficial to self and most importantly to the community of San Pedro, Ambergris Caye. Thank you again and congratulations!